It’s light bronze color and distinctly hoppy flavor. 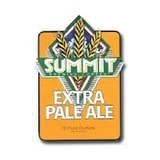 Summit Extra Pale Ale is not a beer brewed only for beer snobs. Just the opposite. It’s a beer for everyone to enjoy: construction workers, stock brokers, farmers, sales people, clerks, teachers, lawyers, doctors, even other brewers. Its light bronze color and distinctly hoppy flavor have made it a favorite in St. Paul, Minneapolis and the rest of the Upper Midwest ever since we first brewed it back in 1986.